Back in 2013, Staten Island filmmaker, Geoff Celis, ran a successful Indiegogo campaign for a short film he had been thinking about for quite some time. Shortly thereafter, Geoff rounded up some of Staten Island’s funniest minds and best movie-makers and put his Lucha Libre comedy into the world. Last week, an online version of the film was put into the world wide web. Now everyone can enjoy excellent performances from Tim Duffy, Casey Jost, Kevin Devlin, Michaelangelo Muniz, and even Impractical Jokers star Brian Quinn. Here’s a quick description of the film, for those of you who haven’t scrolled past this and clicked already. 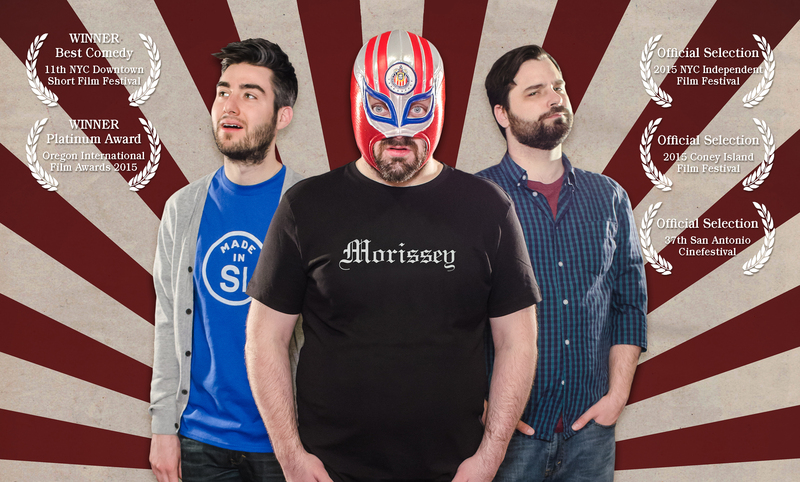 Some Guys Are Bigger Than Others is a short film about Jim, a Morrissey fan who tries to convince hie friends that he can wrestle, but unbeknownst to him, they will enter him into an amateur Lucha Libre Competition. The movie stars comedians Tim Duffy, Kevin Devlin, and Casey Jost. Also starring Michaelangelo Muniz with a cameo by Impractical Jokers’ and the Tenderloins’ Brian Quinn. You can follow Celis’ work on Twitter, here. Interactive Map: Which Part of Staten Island Received The Most Parking Tickets In 2015?